Step 1. Method 1 – the quickest! If you are already at the cinema and see almost nothing:), find the little mute switch on the left of your iPhone’s panel and flick it. You should see the icon with the ringer turned to “Silent” and sense the short phone vibration. Even if your screen is locked and went black, you can tell you did everything right by feeling the short vibration. To go back to normal regime, flick the switch again. Step 2. Method 2 – when having couple of minutes before the event is starting, swipe the screen up to invoke the Control Center. Tap the little “moon” icon, which stands for “Do Not Disturb” regime. In this regime all calls, if not indicated otherwise, will be accompanied by vibration only. Cool! No annoyance! If you want to go back to normal regime, invoke the Control Center again and tap the “moon” button again. That’s it. Step 3. Method 3 – for those, who prepare everything in advance. Tap the “Settings” from your home screen. Tap “Sounds”. Step 4. 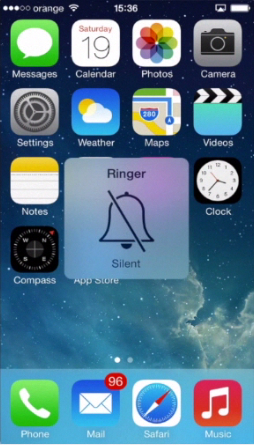 Inside the menu, make sure that both “Vibrate on Ring” and “Vibrate on Silent” functions are toggled to “ON” – they should be green. Step 5. 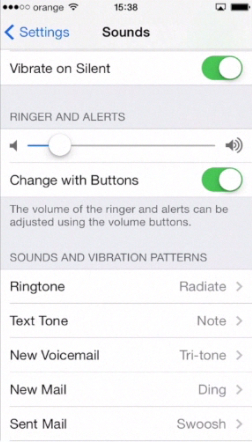 Now, under “Ringer and Alerts” slide the volume indicator to the leftmost position. That’s it! When they call you, the minimized sound will not be heard, but the vibrating mode will be working instead. To go back to normality, access the “Sounds” menu again and slide the volume indicator’s knob back to the usual sound level. Result: Great! Now you know all about switching your iPhone to vibrating mode.